VALPARAISO – Dr. Jessica D. Williams is the newest member of Porter Physician Group’s Northwest Indiana Cardiovascular Physicians practice. Williams was raised in Gary and was the valedictorian of her graduating class at Horace Mann High School. She earned a bachelor of arts degree in sociology from Northwestern University and completed additional pre-medicine courses at Indiana University Northwest. Williams earned her medical degree from the University of Louisville School of Medicine in Kentucky. 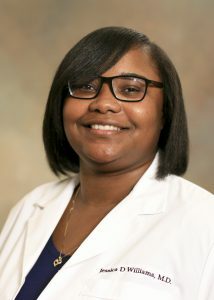 Williams completed an internship and residency in internal medicine at the University Hospitals Case Medical Center/Case Western Reserve University in Cleveland, Ohio. Williams is fellowship-trained in cardiovascular disease from the University of Cincinnati Medical Center, and is board certified in both internal medicine and cardiovascular disease.